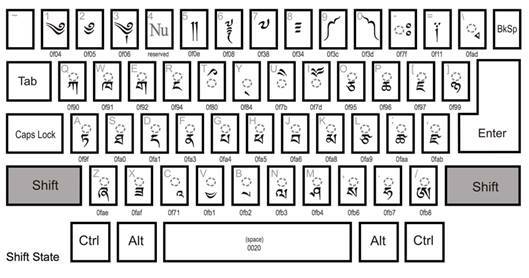 “Perfect” Tibetan input software is jointly developed by Department of Computer Science in Jinan University, sponsored and supervised by H. H. Tudeng Nima (Alak Zenkar) Rinpoche. 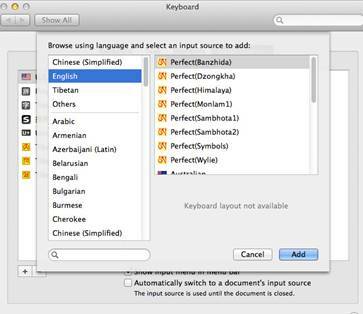 Perfect 2.1 comes with 8 optional Tibetan input keymaps, including Himalaya, Banzhida, Monlam, Wylie, Sambhota, Dzongkha, and Symbol, with a phrase input dictionary containing up to 180,000 phrases. 1） Installation: a) Run "uninstall-perfect.app" to uninstall the old version; b) Run ”perfect 2.1.pkg” to install; c) logout to finish installation. 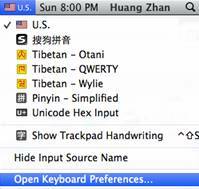 2） To launch the Perfect input method: Click the input method icon on the upper right of the screen, select "Open Keyboard Preferences " in the drop down menu, then Click the “+” button, select “English”, and add your prefered Perfect keymaps from the “Input source”. 3） The input method has two input modes: The “phrase input mode" and the “verbatim input mode", and the “phrase input mode" is default. 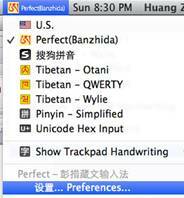 Select the “设置 Preference ” for switching among the modes or getting help information. 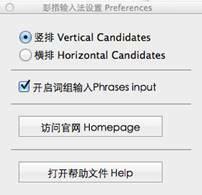 4） In the "phrase input mode", a candidate window will pop-up, use the “Number Key” or the“Enter Key” to select a candidate and, if necessary, use the left or right arrow keys to turn pages, and use the up or down arrow keys to move up or down in the candidate window. 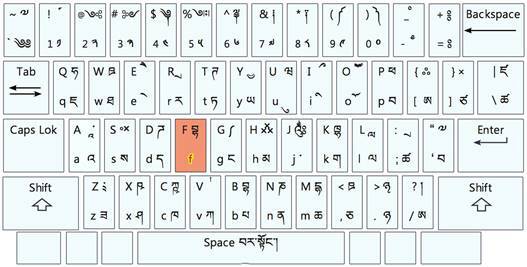 5） Use the Enter-key to confirm the input result. 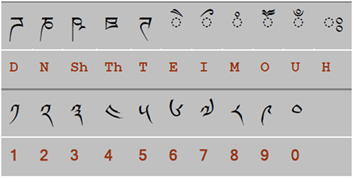 Stacks can also be typed by using the plus-sign '+'. The “a” vowel can be omitted. Press the “Enter" key to confirm. 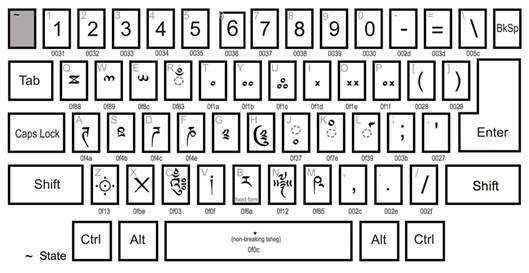 Five keyboards are provided: "Regular Keyboard", "Shift Keyboard", "m+Shift Keyboard”, and "M Keyboard", as shown in Fig.1-Fig.5. 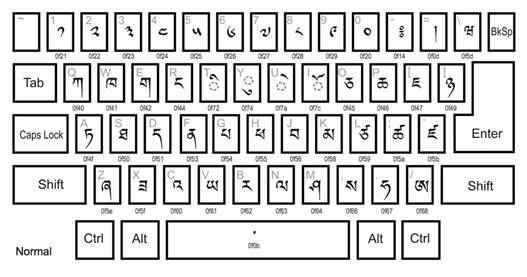 Notice that the "m+Shift Keyboard” is corresponding to the Microsoft Himalaya "Alt+Ctrl+Shift Keyboard”. 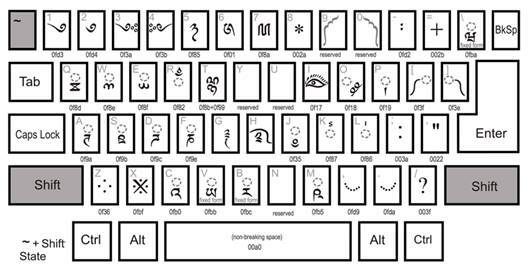 Figure 1 The "Regular Keyboard"
Figure 2 The "m Keyboard"
Figure 3 The "Shift Keyboard"
Figure 4 The "m+Shift Keyboard"
Figure 5 The "M Keyboard"
Four keyboards are provided: "Normal Keyboard", "Shift Keyboard", " ~ Keyboard", and " ~+Shift Keyboard”, as shown in Fig.7-Fig.9. 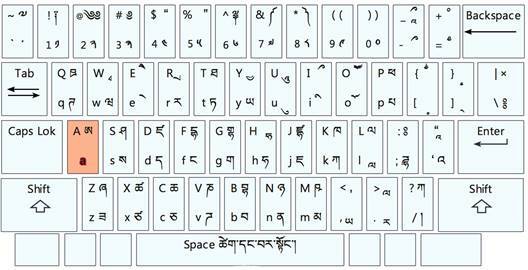 Notice that the " ~ Keyboard” is corresponding to the Dzongkha "Option Keyboard”, and the " ~+Shift Keyboard” is corresponding to the Dzongkha "Option+Shift Keyboard”. 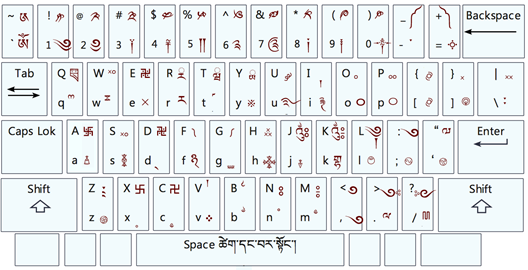 Figure 6 The "Normal Keyboard "
Figure 7 The "Shift Keyboard"
Figure 8 The " ~ Keyboard"
Figure 9 The " ~+Shift Keyboard"
This keymap includes almost all the Tibetan symbols, punctuations, marks and signs listed in the Unicode table http://unicode-table.com/cn/blocks/tibetan/.